Involuntary oscillatory skeletal activity to produce heat. 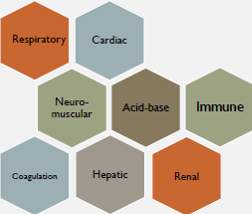 Relies on glyconeogenolysis (??) or lipid/protein catabolism. Increases metab rate 4-10x baseline! *****If core body temp drops by _________*C, leads to _________% drop in CO2 8* = 50% drop! 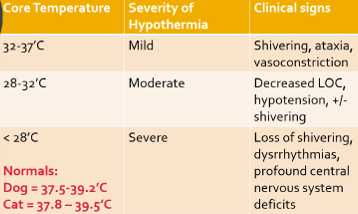 neuro effects of hypothermia? unconsciousness common, Cerebral metabolism drops 6-10% for each 1‘C decrease in core body temp! This is protective at first-- patient might appear dead (bradycardia and unconsciousness). *****If core body temp drops by _________*C, need additional _________ min of ANX recovery time 2* = 40 min!! explain primary vs secondary coagulation in the face of hypothermia PRIMARY: Apparent thrombocytopenia due to sequestration in the spleen, Platelet dysfunction (reduced THROMBOXANE B2), Disruption of the fibrinolytic system (--> DIC!). SECONDARY: Prolongation PT, PTT. Warming blood results in NORMAL coag results!